Did you know you might have prediabetes or diabetes but aren’t aware of it? More than 84 million adults (more than one in three) in the U.S. have prediabetes, reports the Centers for Disease and Prevention Control. Prediabetes means having a higher-than-normal blood sugar level that isn’t yet considered diabetes. The CDC notes that having prediabetes increases the chances for developing heart disease, stroke or type 2 diabetes, the most common of type of diabetes in which the body doesn’t properly use insulin. Additionally, more than 30 million American adults have diabetes, which can lead to heart attack, stroke, blindness, kidney disease, loss of lower limbs and other serious health issues. 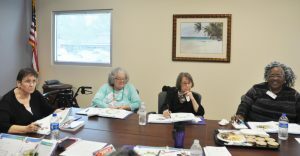 During Nutrition Month in March and approaching Diabetes Alert Day on March 26, we look at a CDC-based Diabetes Prevention Program aimed at decreasing the risk of diabetes for our participants at Suncoast PACE (Program of All-Inclusive Care for the Elderly), a member of Empath Health. Our Empath Health Pharmacy staff teaches the class healthy behaviors for diabetes prevention, including mindful eating, physical activity, stress management, better sleep and diet trends and myths. 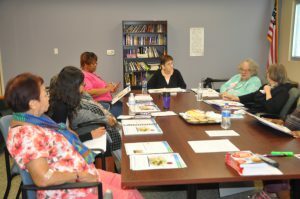 The group recently met for their fourth session. They focused on healthy and nutritious meals, from grilling or stir-frying with healthy oils and fresh lean meats and vegetables to eating fruits and whole grains to limiting intake of sodium and sugar. “It’s important to see how you can eat. We will talk about what’s healthy and what’s not healthy. You can use alternatives to salt and not stop salt altogether,” explained Christina Assad Pharm.D, BCGP, CPh, CDE, a clinical pharmacist for Empath Health Pharmacy. Garlic and herb seasoning mixes and other herbs were suggested as salt substitutes. “Adding herbs, like thyme, can intensify the taste of veggies or meat. I can use less salt and that’s going to take down my blood pressure and weight. I ain’t gonna say that I ain’t gonna ever have salt, but I would like to achieve that someday,” said Suncoast PACE participant Yvonne D. Baldwin-Johnson. Calories were another point of discussion. “What’s the difference between calories and carbs? How do we get high cholesterol? 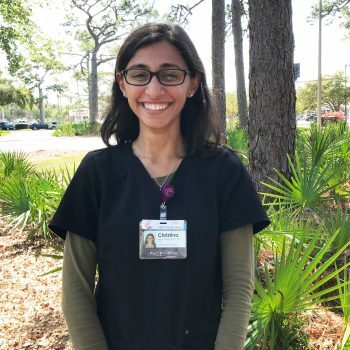 Why should we choose foods that are low in fat and calories to prevent diabetes?,” asked Amar Vora, a pharmacy technician for Empath Health Pharmacy. Building a balanced and healthy plate was another topic. “Non-starchy veggies should be the biggest part of your plate. Frozen or even canned veggies can be used as long as they are low-sodium and rinsed off,” noted Vora. Some participants shared their successes, challenges and goals around food choices and physical activity. Baldwin-Johnson reported areas of progress and needs for improvement. Click here to take a test to find out your risk for prediabetes. You can also ask your doctor to test your blood sugar level. Click here to learn more about Suncoast PACE.